The International Police Commission, a member of the United Nations – Economic and Social Council (UN - ECOSOC), is a duly registered international non-profit, non-secretarial, peacekeeping and social development paramilitary organization base in the State of California, United States of America with extension commands in member nations of the U.N. such as the Philippines. 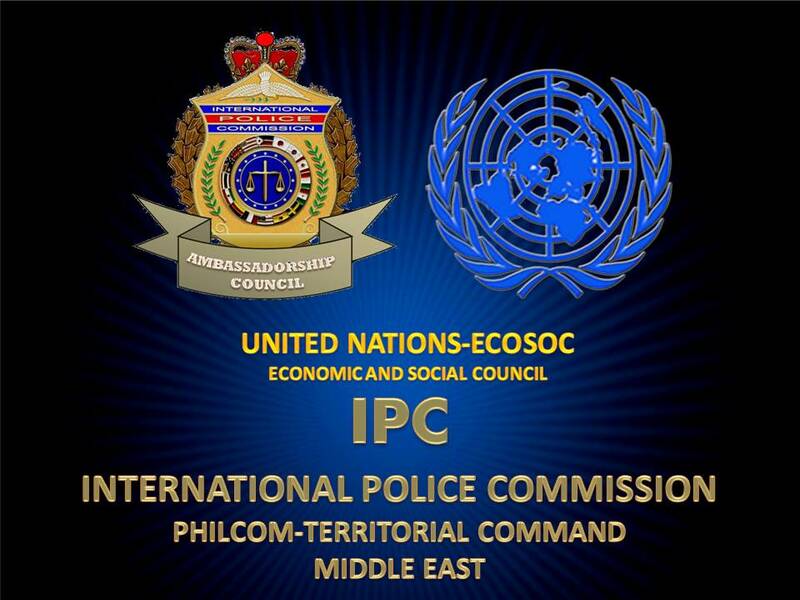 The IPC-PHILCOM is committed to carrying-out our general mandate and objective of ensuring peace and order worldwide and is ever ready within our capacity to assist all law enforcement agencies of member nation of the United Nations in the campaign against criminal elements especially international criminal syndicates and terrorist organizations, involving the supreme citizen’s power under the Constitution of all nations to ensure equality of justice., freedom and democracy and to assist the governments of the member nations of the U.N. in humanitarian, socio-civic, and peace keeping operations, while being a catalyst for social development through socio-civic and economic development programs and projects. More so, the Commission compliments alerts statues in surveillance and apprehension of persons in the most wanted list sought by police forces worldwide, track such persons, shares intelligence report government and non-government agencies and effects arrest upon compliance of vested power of arrest. The Commission’s resources are vested with power and cloth as natural persons of constitutional authority with basic inherent right to perform such duties and responsibilities as Staff Officers and Confidential Agents. al cooperation for joint operations and monitoring international developments that may lead To future needs.